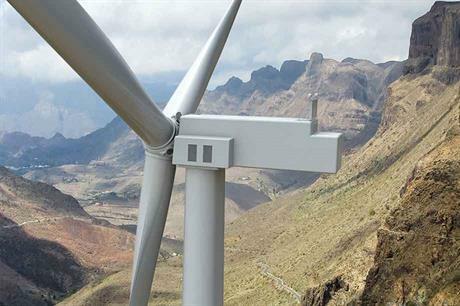 UNITED STATES: Expertise from subsidiaries LM Wind Power and Blade Dynamics contributed to the big, new, onshore platform, as GE Renewable Energy's cherry-picking begins to pay off. GE Renewable Energy has announced details of a new 5.3MW onshore turbine joining a previously unveiled 4.8MW model, with the same 158-metre rotor diameter, on its "Cypress" platform. This latest iteration will offer a 50% increase in annual energy production over GE’s 3MW platform, the company claimed. The new model will be designed for IEC S-class wind speeds and, as with the 2MW and 3MW platforms, will use a doubly-fed induction generator. This evolution comes just over a year since GE unveiled the 4.8MW. With the 5.3MW coming hot on its heels, Peter Wells, the company’s onshore CEO for Europe and sub-Saharan Africa, admitted sales of the predecessor would be affected, but said with the speed at which the industry was moving, a new model made better business sense. Speaking at WindEnergy Hamburg 2018 at the end of September, where GE unveiled the model, Wells explained: "If you go back a few years, the evolution of new turbine types was, maybe, one a year. "But because of the level of competition it now seems every six months something else comes to the market. "As we started to bid, in Germany in particular, with the 4.8MW we recognised very quickly the 5.3MW was a much better value proposition. It was a very easy change, so why not?" said Wells. Like the 4.8MW, GE’s new turbine will use a two-piece blade design, produced by LM Wind Power. Its CEO, former GE executive Duncan Berry, said the switch to a two-piece blade offers cost savings and allows the use of longer blades in more remote areas. "One of the big benefits is it can reduce costs from a logistics standpoint and allow access to places which would be hard to get access to [otherwise]," said Berry. "Our 107-metre blade [for GE’s 12MW offshore turbine] is made as a single piece. So, technically, there’s no problem to go longer. The challenges come around how you manufacture and how you transport. "If you have manufacturing on-site then you need to make sure the load envelopes work for the turbine, and that you are not adding significant additional weight, particularly closer to the tip. "We have been able to get to a weight, or mass, that is close to a one-piece blade," Berry explained. The new blade also means LM’s global manufacturing footprint can continue to operate without the need to expand. GE is now seeing the benefits from the acquisitions it made in the middle of the decade, namely LM in 2016 and UK outfit Blade Dynamics, which had developed modular blade concepts and was acquired by the US-based firm in 2015. "We have been able to lean on the deep technical knowledge that exists in the broader GE group. We had the confidence to invest significantly in the R&D programmes and so we have more confidence and you are seeing that coming out now," said Berry. "After the acquisition of LM by GE, the Blade Dynamics team was transferred to the LM team. "They have brought a lot of experience around to take designs into early stage manufacturing and prototyping, and not just around two-piece blades — it was much broader. It allowed us to take one and one to make three. It was a real plus," he said. Wells agreed. "If you are to continue to push and set the next generation of technology, you need that capability. Blades are anywhere from 25% to 35% of the cost of a turbine. It is a massive factor, so you need to get that right, and I think we are seeing the dividends of that now." The new model cements GE as the market leader in both onshore and offshore markets in terms of turbine capacity, following the announcement of its 12MW offshore machine in February. GE’s overall onshore wind CEO, Pete McCabe, said the 4.8MW prototype is currently being produced at GE’s Salzbergen facility in Germany and could be installed by the end of the year. As for the platform name, Wells explained, "Cypress" was chosen "because it is a tree, it is strong, it grows tall and it can survive in lots of different locations, so it is very flexible. "The more the team looked at what Cypress represents as a name, the more it seemed a good fit." In Greek antiquity, Cypress trees have connotations of death and mourning. GE will be hoping for the opposite from this platform.